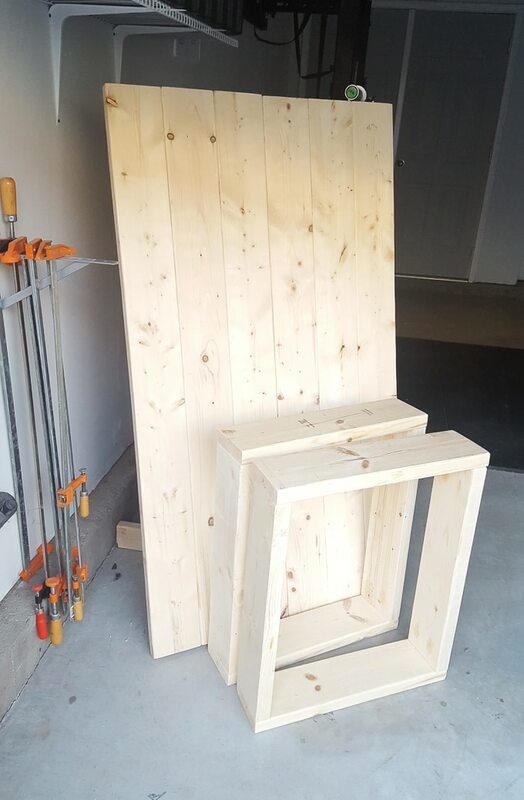 So I found Ready Seal because I was looking for a quick and easy solution for the outdoor table and benches I am working on. There was once a day when I would do a normal stain to get the perfect color and then several coats of an outdoor sealant. Not now, folks. I’m working during nap time, so I needed an all-in-one solution. Ready Seal Professional-Grade Wood Stain and Sealer is that solution. I read some reviews online, and they made it sound pretty easy. The can says no laps, streaks, or runs. UV blocking, water proofing, and mildew resistance. So I ordered a can of Dark Walnut, the darkest color it comes in. And here is what one coat of the stain looked like on half on the top. I applied the stain with a chip brush on the benches and with a small foam roller on the table since it had a bigger surface area. Both are equal options, in my opinion. The roller was faster, but I did end up having to whip out the brush to get in to some of the nooks and crannies. Since I’m cheap, I use brushes and rollers multiple times for one project. I like to avoid washing out things that don’t just have an easy soap and water cleanup. 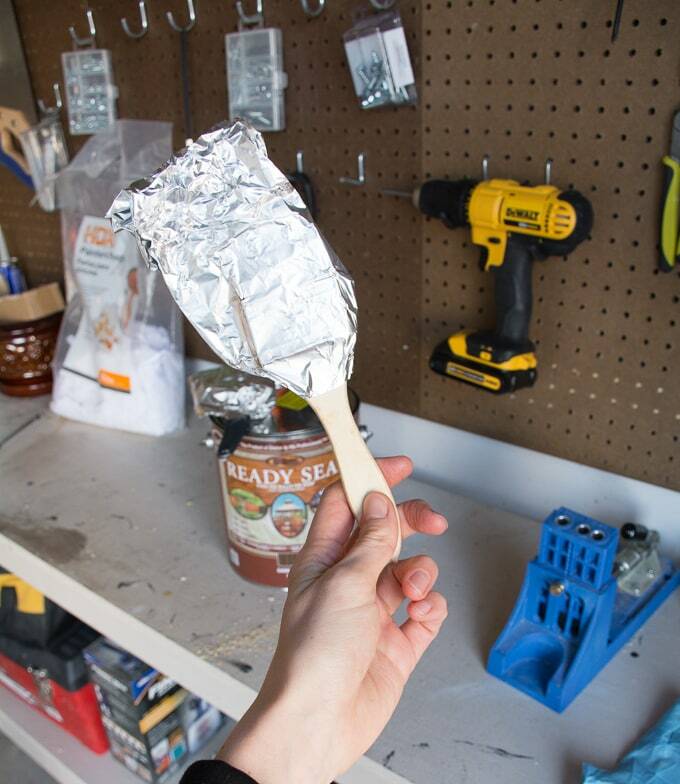 To keep the brushes and rollers from drying, I wrap them in aluminum foil. 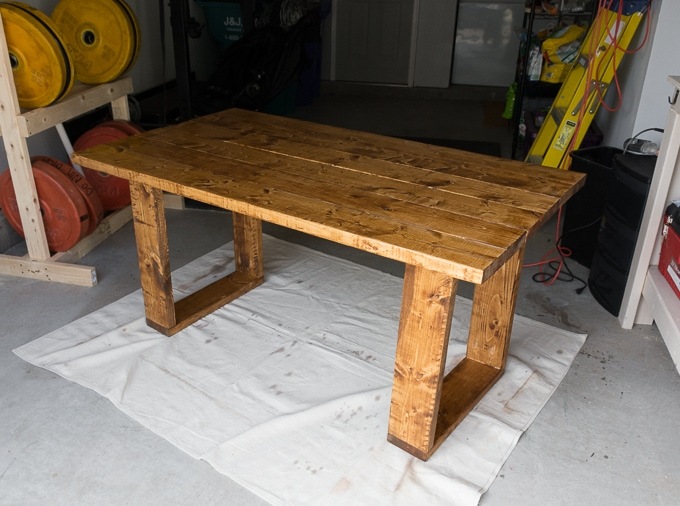 Here’s what the table looked like with the stain fully applied (still wet on the top, dry on the legs, so you can see there isn’t a big color difference at all). One coat for stain and sealer with a decent variety of colors. I can order it on Amazon and it’s a pretty good price for a gallon can. The can goes a long way, too. I used it for a large table and two benches and barely made a dent in a can. I’d imagine if you were doing a deck or fence, one gallon would actually go a very long way. Easy application. Much easier than a water- or oil-based polyurethane. 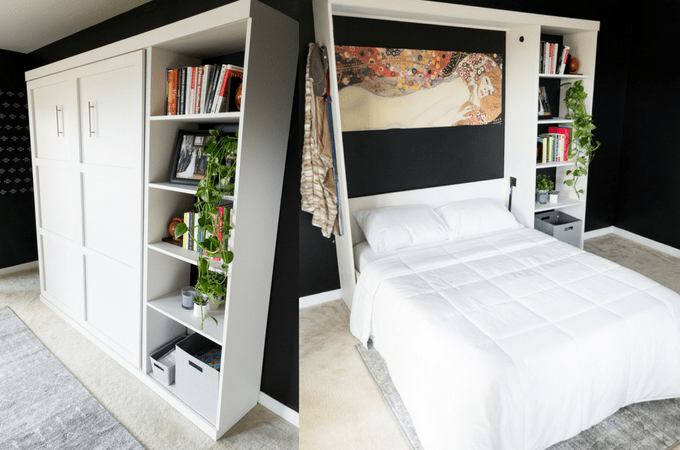 You can have absolutely no painting or finishing skills and use this without messing it up. It really is goof-proof. Not a terrible odor like some stains and finishes have. The Dark Walnut color wasn’t really a dark walnut. I picked the darkest color they had because I wanted a darker stain for this set. But Dark Walnut had a much more golden brown tint to it than I’d expected. A second coat didn’t make a difference. The first coat sunk in and was dry to the touch within a few hours. 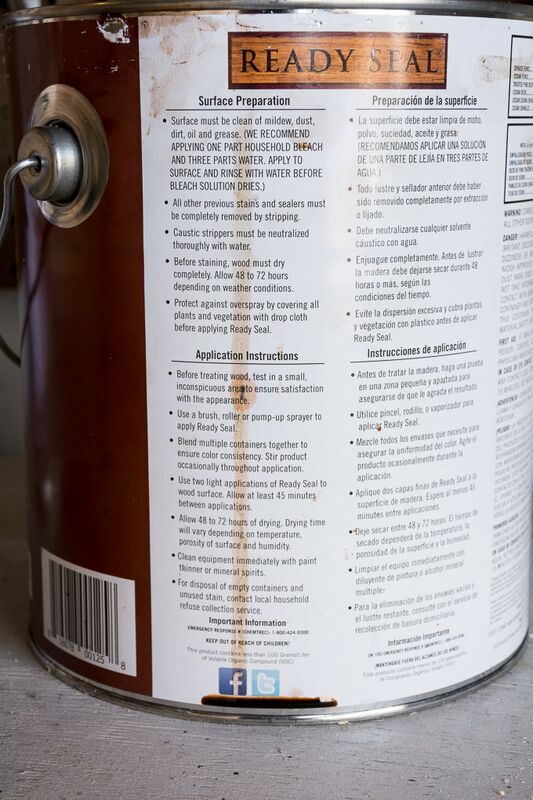 The can says to wait at least 45 minutes for a second coat and 48 to 72 hours to dry completely. But the second coat took days to dry at all and was still a bit oily. At first I thought I’d put it on too thick, but I don’t think I did. I ended up wiping the piece down with a cloth and putting it outside in direct sun/breeze to speed up dry time. That did help a lot. Considering this stuff is really made for fences and decks, I didn’t mind setting the pieces outside as long as there wasn’t rain or snow in the immediate forecast. The verdict? I definitely recommend it. The ease of acquiring it and applying it made up for the fact that the color wasn’t exactly what I’d hoped for and that it took longer than I’d expected to dry. I’m happy with it—what do you think? First of all I would like to say welcome back! Thank you for the information. I have a few wood projects coming up and it helps to have information available on stains. I actually really love that the wood grain shows like it really popped with the stain. I know it may not have been as dark as you hoped for but that tells me that I really need to be mindful at looking at finished results when I look for wood stain. Thank you! First, you correctly recognized that the Dark Walnut wasn’t as dark as you’d hoped. The reason for this is that it was applied to a brand new white wood (non-treated pine). Ready Seal is a semi-transparent penetrating stain, not a solid paint or coating that sits on the surface. It is designed to penetrate into the wood and enhance the natural beauty and color of the wood, any wood that your choose. Dark Walnut will look different on pine than it will on oak or cedar wood. I have Dark Walnut on my rough-cut cedar fence at home, and it is a rich, dark brown shade. The lighter woods will yield a lighter result than a darker wood, and the red woods will also affect the final color as well. 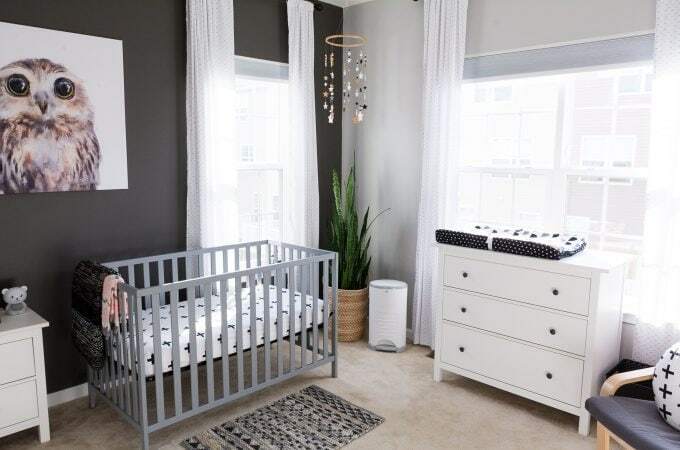 If you visit the photo gallery on our website, you can preview various colors on different kinds of wood to get a good idea of what your results will be. Second, your experience with the second coat not drying is very normal and not unusual on brand new wood. 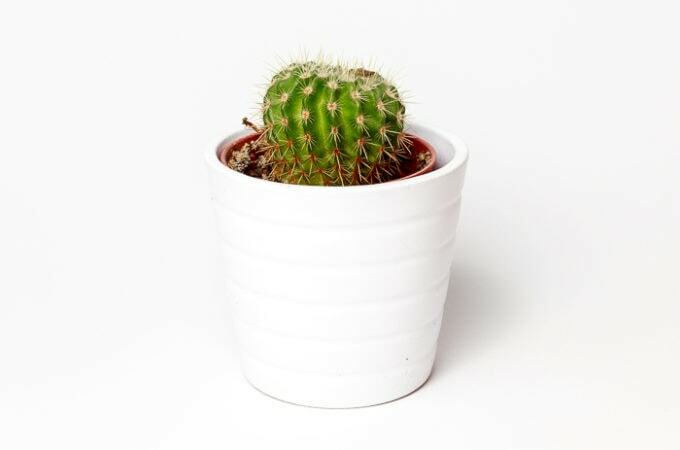 Wood is a natural fiber that has pores that change and open up over time. 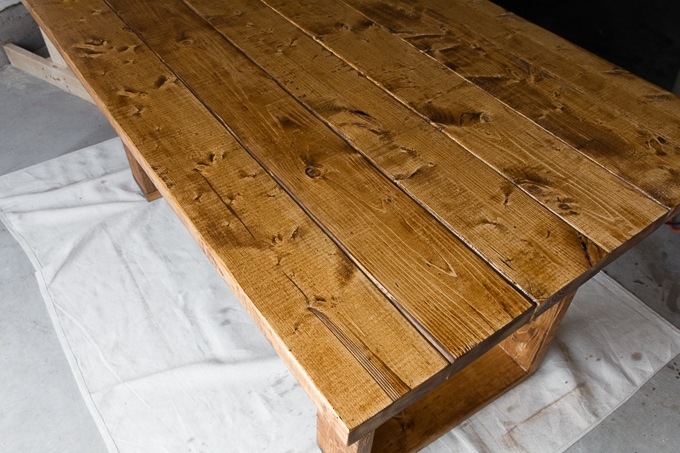 Brand new, smooth-milled wood like the pine you used for your table, is very dense and the pores of the wood have not opened fully. So your project will only take a single coat of Ready Seal right now. 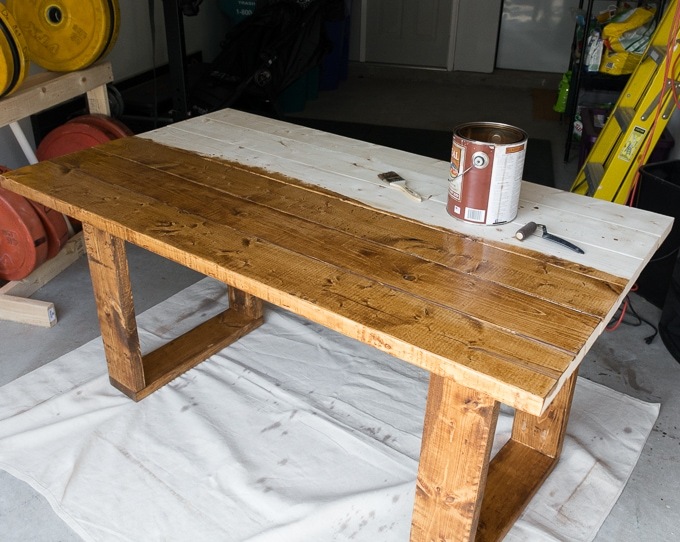 A second coat has nowhere to go since the wood pores have not fully opened up yet, so you are right– it will just sit on the surface and won’t dry. We generally recommend two coats on rough-cut wood or older wood that is being refinished, because the wood will absorb two coats and will give you the maximum sealing protection. For brand new wood and/or smooth-mill wood, it may take a few years for that to fully open up to where it can receive a second coat. If there’s ever an oily residue left on the surface after Ready Seal application, that means the wood can not absorb any more product, and you can run a rag or mop with mineral spirits on it over the surface to remove that residue. It should dry fairly quickly, and you should be left with a matte surface. There are some other application tips and information you can find on our website, or anyone is welcome to call our office during normal business hours if you have additional questions (888.STAIN.4.U). 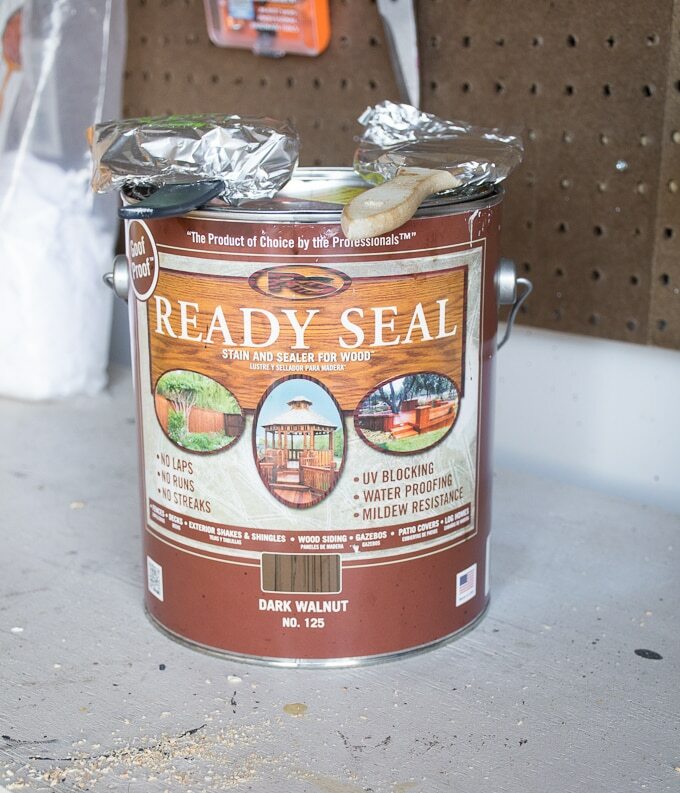 The most important tip to remember when using Ready Seal is that the wood needs to have any previous coatings or products completely removed AND it must be completely dry (internal moisture content of the wood needs to be 12% or less, as gauged by a moisture meter). If these two steps are followed, Ready Seal will go on beautifully! I’m sorry for the lengthy comment, but I hope it helps answer any questions anyone has. We’d love the chance to earn the business of your readers. Thanks again for reviewing Ready Seal. 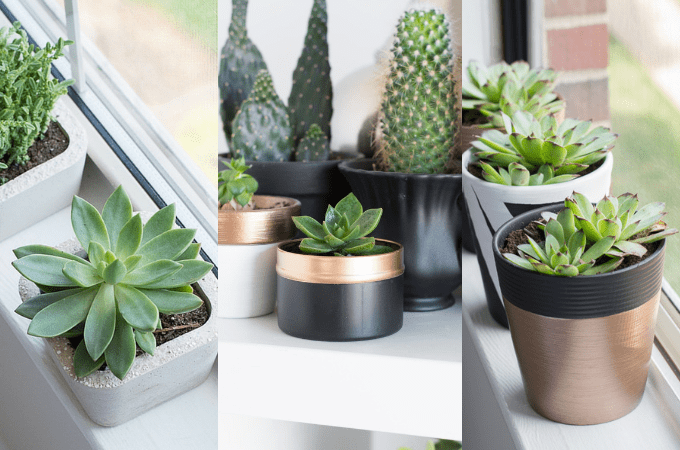 Love your table and all the other projects on your blog! Oooh love the color! I am usually a dark stain kind of girl too, but this looks amazing – very outdoorsy :).